Arthur Loevy, Secretary/treasurer of the Amalgamated Clothing and Textile Workers Union, was honored at Chicago Democratic Socialists of America's 32nd Annual Debs-Thomas- Harrington Dinner May 4, 1990, at the Midland Hotel. Featured speaker was Cecil Roberts, vice president of the United Mine Workers, who talked on "Victory Over Pittston: Lessons and Strategies for Labor and the Progressive Movement in the 90s.". In 1996 Cecil Roberts, United Mine Workers of America was one of the original 130 founders of Campaign for America's Future. Every year since the mid 1960s the Indiana based Eugene V. Debs Foundation holds Eugene Debs Award Banquet in Terre Haute, to honor an approved social or labor activist. The 2008 honoree, was Cecil Roberts. 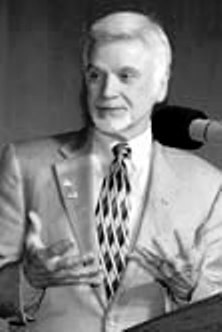 In 2009 Cecil Roberts, President, United Mineworkers of America, Washington, DC served on the board of directors of Healthcare-Now! . Nine miners, including their union's president, were arrested in protests against the nation's largest coal company in St Louis Missouri, January 29, 2013. "I didn't come here today as the President of your union. I came here as a representative of our retirees and our widows, " United Mine Workers' of America international president, Cecil Roberts, told over 1,000 miners, union supporters, community and faith leaders, as they rallied just steps away from the St. Louis Federal Court House. According to the union, Peabody Energy and Arch Coal - the nation's largest coal companies - created the spin-off company, Patriot Coal, in a scheme to rob thousands of union members and beneficiaries of their pensions and health care benefits. Patriot Coal filed for chapter 11 bankruptcy in July 2012. Lew Moye, president of the St. Louis chapter of the Coalition of Black Trade Unionists , called Patriot's actions "despicable and criminal." Missouri state representative, Karla May, Dem.-84, a member of the Communication Workers of America, Local 6300, said, "I stand with you. We know their real goal isn't just to get rid of your health care and benefits. We know their real goal is to destroy all unions." May, who is also a member of CBTU, also told the assembled union members about attempts "here in Missouri, and across the country, to impose so-called right-to-work, which would weaken all unions." This page was last modified on 9 March 2013, at 05:16.